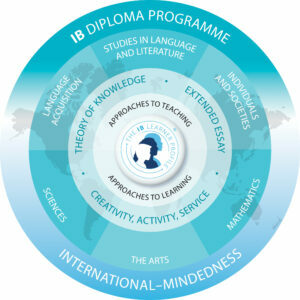 The programme aims to develop students who have excellent breadth and depth of knowledge, who flourish physically, intellectually, emotionally and ethically; study at least two languages, excel in traditional academic subject and explore the nature of knowledge through the programme´s unique theory of knowledge course. DP students are better able, than their peers, to cope with demanding workloads, manage their time and meet expectations placed on them. • Theory of knowledge, in which students reflect on the nature of knowledge and how we know what we claim to know. • Creativity, activity, service, in which students complete a project related to these three concepts. Ages: 16 to 19 years old.